Sometimes there are things so beautiful that we cannot help, as craftspeople, to want to make them ourselves. We become afflicted with this syndrome, and run off to learn how to do these things, sometimes succeeding and sometimes failing. I have recently experienced that special craving in relation to another area of costuming: hats. We all love hats, but I'm sure we can agree that they're HARD to MAKE! There are two ways to make a hat; sewing it, or blocking it. Sewing hats seems the most comprehensible to people who regularly sew. We get some pieces, we sew them together, out pops a hat. It is by no means simple, though, takes many experiments, materials, and lots of time. I'm proud of the couple of hats I've made in the past, but something has always been missing, and that is the beautiful, curvaceous design of a perfectly blocked felt hat. 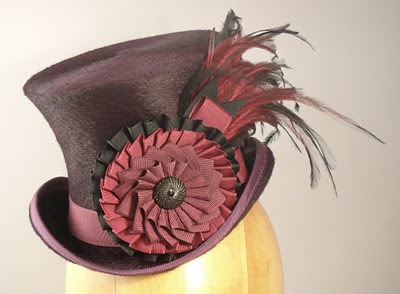 Not too long ago I came across House of Nines Design, a blog about hatting. Tricia makes the most INCREDIBLE hats I've ever seen! I can't afford one to save my life, though I'd buy them all tomorrow if I could! 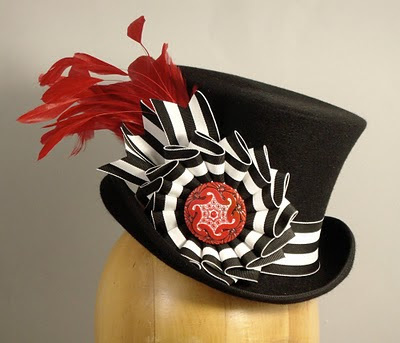 In addition to the blocked hats, she makes insane ribbon cockades, with feathers too, and lace, and veils, and oh it just almost HURTS to look at them! At any rate, I shall keep you updated on my adventures in hatting (and failures, of course!). And hey, maybe some mini tricorn hats and ribbon cockades will come out this! 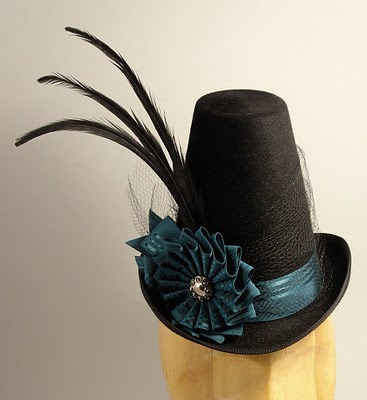 All of these hat images are from House of Nines Design - view her blog, and visit her Etsy shop. Brilliance! Oh I know ex-act-ly how you feel! I know this urge , and this since..ummmm....about 35 years. It is that long that I purchased 2 then already vintage books on millinery/hat making and adorning. Since then I dreamt about - you guess it: making my own. ah yes,the best laid plans! I became interested/obsessed with making shoes awhile back, and went pretty far into before I realised it was super-duper hard and I sucked at it, hahaha. I think hats will be a bit more sensible, although shoes and hats are surprisingly similar. we must be related somehow. after viewing the House of Nines site, I went into a deep (drool)depression - perhaps I could steal some in the night? Keep us posted - if you hear of a good introductory hands on workshop - let us know! Dreamy, what a great blog! I hadn't seen it before but now it's saved in favourites, so I'll scope through it when I've got a free moment. Margravine, LOL! I will make note of any workshops - maybe can get semi-local Lynne Taylor to give one up here, or go to one of hers in Sacramento or Bay Area. I will of course report, as well, on how it's all going on my end - you know me, I love to figure something out and share it with you guys! Oh yes, her hats and cockades are obscenely drool-some! 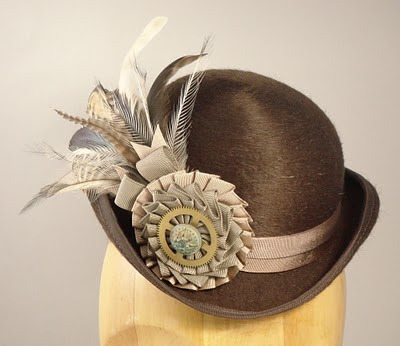 I've been lusting after them for a while too - have even bought some grossgrain ribbon in a plan to make some cockades, but it hasn't happened yet ... Look forward to seeing some of your hatting! Awsome! I can't wait to see how it goes. I have also been facinated with the hat making process! I read this as... Hating: My New Obsession.